Whether you’re relocating to London for a job and bringing a spouse/partner in tow or you are that spouse/partner moving to London for your loved one’s career, then this series of posts is for both of you. I started out on Thursday explaining the difficulties of being an accompanying spouse relocating for someone else’s pursuits (even when you’re happy and excited to be moving!). 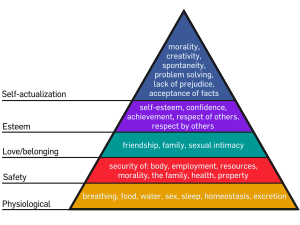 On Friday, I then started delving into why these difficulties naturally exist, that they’re normal in a relocation situation that turns our Maslow’s Hierarchy of Need (see image) topsy-turvy. So today I wish to share my own anecdotal observation of how this pyramid holds up against an international to London (particularly when you’re not moving for your own job or schooling). Speaking from my own experience, when I found myself living out of a hotel room and three pieces of luggage for three weeks, my basic physiological needs, thank goodness, were still being met (there was a faucet, bed, toilet, and plenty-o-pubs nearby! :)). But I’d already lost my footing at the next tier of the hierarchy—safety—being newly unemployed, unfamiliar with the city, and without a London apartment to call my home. It wasn’t easy for my husband to be homeless either, but at least he could go to the office every day and interact with colleagues, already make new friends among them, feel the satisfaction and security of earning an income, and encounter not so much as a blip in his career continuity. And to really generalize the sexes, as a woman, I value relationships more heavily than he does, so leaving close family and friends behind just about ripped my heart out. I’d lost my professional and personal circles, which then eroded away at the next tier of love and belonging; yes, I had my husband’s love, but his attention was divided between me and adjusting to his new work role, and though I have always been able (if not preferred) to do things alone, it’s when you know it’s not optional that you can truly feel lonely. Add to that the fact I was no longer contributing an income and my days lacked structure and purpose, so my self-esteem was the next in line to go. I pursued work in my profession (teaching), but when conditions were so disappointing that I didn’t want to continue, as much as I’d felt entitled to a better quality of work (the same as I’d had back home), I mostly blamed myself afterward for giving up, for being too weak to make an outrageously difficult situation sustainable, even though factors beyond my control had set me up to fail. I had already changed careers from Finance a few years prior, so having to redefine myself professionally yet again (and not of my own volition this time) was so not awesome. And though I tried to then become more domestically-focused instead, I felt incompetent and uninterested in it, so now I saw myself as a failure at both work and home. And I wondered if my husband still respected me, if he realized how hard I was trying, that I wasn’t just sitting around on the sofa eating bonbons and watching Coronation Street all day-every day. And the more I wondered if he respected me, I doubted that he did and then resented that he put me in this position to begin with—so I then lost my sense of respect for him, too. I constantly fell back on what I had achieved, what I used to be and could once show for my life, which all the more rubbed in how much I didn’t know who I was now. Try achieving self-actualization in THAT frame of mind…you can’t. At least in theory you can’t, not until the lower levels of needs are met. So what can you do about it? Join me in Parts 4, 5, and 6 for some steps you can take as an individual and as a couple to re-lay your foundations and rebuild on them with the sky as your limit. An international relocation to London can surprisingly be what knocks you down only to raise you higher.